The seminar Tools and Resources for Digital Humanities Research was organized by the staff of the Artificial Intelligence Laboratory (AILab) of the Institute of Mathematics and Computer Sciences, University of Latvia to showcase the language tools and resources developed at AILab. The seminar took place on February 1, 2018 and brought together a wide range of humanities researchers, including philologists, journalists, political scientists, translators, librarians, historians and other representatives of the Humanities and Social Sciences. 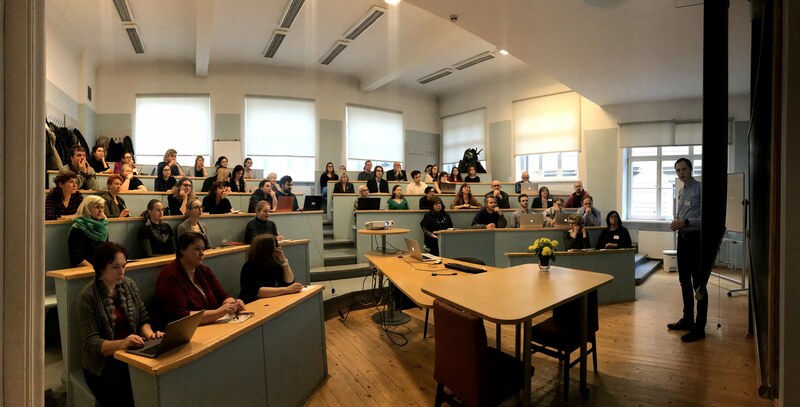 Among the audience were both students and experienced researchers who wanted to find out what tools were available for the analysis and processing of Latvian texts and how to use corpus linguistics methods, for example, in Literary Studies. During the workshop, CLARIN national coordinator Inguna Skadiņa introduced the attendee s to CLARIN and outlined the plans to establish the CLARIN infrastructure in Latvia. Although CLARIN was already actively disseminated during the preparatory phase, which ended in 2012, this seminar was the first event in which CLARIN Latvia was presented to a wider audience after Latvia joined CLARIN ERIC. The participants were introduced to the national and international aims of CLARIN and were invited to actively participate in the creation of the CLARIN network of expertise in Latvia. Other speakers presented tools, resources and research projects which are to serve as the backbone of CLARIN Latvia. Artūrs Znotiņš and Pēteris Paikens presented different types of text analysis, such as lexical, semantic and sentiment analysis, and the tools available for such analyses. Baiba Saulīte and Ilze Auziņa introduced the on-going project Full Stack of Language Resources for Natural Language Understanding and Generation in Latvian. The project aims to create multi-layered semantically annotated language resources for Latvian, anchored in the widely acknowledged multilingual representations of lexico-grammatical relations, such as PropBank, FrameNet and Universal Dependencies, and showcase their use by developing an advanced Latvian abstractive text summarizer to be evaluated on the media monitoring use case. Roberts Darģis introduced the corpora developed at AILab and demonstrated their use for digital humanities research. Finally, Ilmārs Poikāns turned to methods and tools for digitizing language and history materials. The workshop attracted so much interest that not everyone had the chance to participate: the maximum number of participants was 50, but nearly 100 people signed up for the seminar. The great number of participants from diverse research backgrounds showed that there is much interest in the use of language tools and resources among Latvian researchers. What is more, after the seminar, several participants registered for the Master’s course Introduction to computational linguistics, taught at the Faculty of Humanities, University of Latvia. In addition, experts from CLARIN Latvia discussed possible opportunities for collaboration with political scientists from Riga Stradiņš University and translational scientists from Ventspils University of Applied Sciences. Blog post written by Ilze Auziņa, edited by Darja Fišer and Jakob Lenardič. Photos by Kristīne Pokratniece.